I'm interrupting your normal reading pleasures of corbels, shams, duvets and settees (unknown words to me until I met Kat) to present my very first blog post. My wife asked me the other day if I wanted to be a guest blogger to talk about my trip to the Final Four last weekend. Of course posting on her sacred blog comes with a lot of pressure as I think that she does a great job at it. But mostly because if I make a grammar mistake she pretty much will shred my life (see second last sentence on the side bar). That's life being married to a former English teacher. 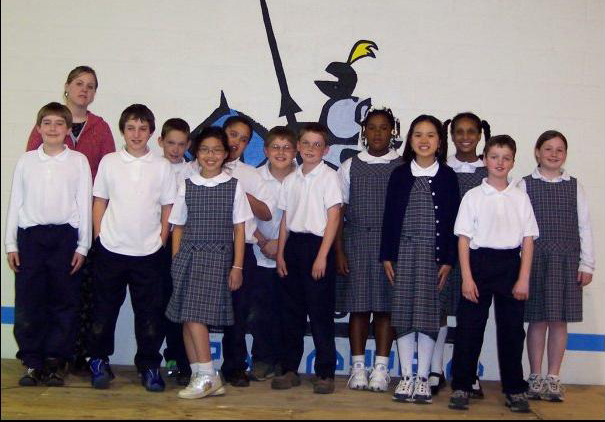 Here is her 4th grade class from like 8 or 9 years ago. She's the tallest and cutest one. So last Thursday, my friend Seth and I flew from Philadelphia to meet my brother-in-law, Tim, in Houston. This was no ordinary trip for us because everything was 100%, free-to-spend-with-no-conscience, all paid for. Yep, air travel, hotel, food, golf, and the Final Four were no cost whatsoever to us. For an average middle class man such as myself this was pretty much the trip of a lifetime. To give you a background, Tim installs tile basketball courts in the Detroit area for a company called Sport Court. Apparently, there was a rich business owner from California that was adamant that Tim come to Houston to set up an indoor basketball court. This guy was throwing an all weekend Final Four party for other rich people. He said he could bring some guys with him and would pay for it. So Tim asked us. At first, both Seth and I were like, "There's no way we could go, but surprisingly our wives were like, "Are you nuts, of course you're going." So thank you wives! Here is the court that we set up at the party. It was actually on a stage. All we really had to do was set up the court on Thursday and part of Friday and then come back and tear it down on Monday. The rest of the time was spent getting lost all over Houston and doing whatever we wanted while spending someone else's money. Probably our favorite thing to do was eat. If you're in Texas, you gotta hit up the BBQ. This was at a place called Gabby's and may have been the best meal I've ever eaten. That my wife hasn't made of course. ;) Check out this healthy meal. One day we went golfing and the bill was like $338 for 3 people, but what did we care since we weren't actually paying for it. I know that I have a sweet follow through. Yeah, I also know the ball is still on the ground. I promise it was a practice swing. There was also some huge NCAA event going on that weekend in the area. We found ourselves engulfed by people at this place called Bracket Town. It was a large facility with vendors displaying all their sporting equipment and courts with games and whatnot. Here we are at a major basketball tournament and what is the only sport that I care to take part in? The hardest hockey shot competition of course. Oh yeah, I had the hardest shot of the day at 64 mph. So anyway before this post gets too boring about all the stuff that we did, we did actually get to the games too. Here are our tickets to prove it. Reliant Stadium where the Houston Texans play. There were a measly 75,000 people at each game. Leanne Rimes singing the national anthem and a huge American flag. We also saw George H. Bush and Barbara there both nights too. We sat in the front row of the upper deck but still could see everything. In the end, UCONN ended up being the champions. Mainly because Butler played horribly. So after 6 days of endless fun and unremorseful spending, our trip ended with the long flight home. It was truly a great weekend despite Seth's bag being lost by the airline. So the greatest lesson I learned from this trip that I can share with you is: if you ever go away on an all-inclusive, once in a lifetime sporting trip for 6 days while leaving your wife at home with two young, loud and energetic kids, make sure the thank-you present you buy for her isn't stored in Seth's bag. That was a great read! What an amazing trip! Did you actually lose Kathleen's present?! That's horrible! Did you get it back? Yea, the airline did lose the bag with her gift in it. A couple of days later, they returned the bad to Seth but it was destroyed. Luckily, the contents including her gift were still intact. It sounds like an awesome trip. There is nothing like a free trip especially a nice one! Oh my heart, that is the biggest baked potato I've ever seen! Looks like you had a good time. I see more spa time in Kat's future.